Meet contemporary Indian artist Archana Prasad. Her modern style of art reflects the exciting urban milieu of Bangalore, India. As a visual she uses video and digital tech as her primary medium of self-expression. Video art and Community or Public art are her forte. Archana's ink on paper drawings use her background as an animation film-maker in a language that is at once original, distinctive and beautiful. Archana Prasad studied her Bachelors in Painting and Masters in Art History at CKP, Bangalore. She also has a Post-Graduate Diploma in Animation from NID, Ahmedabad. Having spent close to 3 years as a Design Researcher at Microsoft Research India, Archana left the IT world in late 2007 to pursue art full-time. During 2008 she had exhibitions of her work in Berlin, Cologne, Naples as well as in Bangalore. Apart from her formal studio work in drawing, animation and painting, she explores the world of art through multiple ways. Her previous association as lights and video performance artist with Bangalore’s upcoming bands – Lounge Piranha and Bobbleheads explore the performance video art space. She has performed at more than 50 events and has toured across several Indian cities with these bands. Additionally she has initiated an experimental docu-performative sound and video public intervention project - CitySignals. Archana is actively engaged with community art practices including running the online communications for the Bangalore City Project that aims to explore ways by which people can connect with the city through cultural practices. 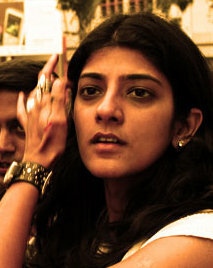 She is also the Executive Editor of Art & the City, an online journal on the state of the contemporary arts in India. It is instituted by the Goethe Institut, Bangalore. She is the Co-initiator and Facilitator of Samuha an artist initiative and collective that launched on 22.6.09. She is Co-Founder of Jaaga, a community based art-architecture project. Archana also spends a significant amount of time with the Crafts Council of Karnataka as a designer and member. On weekends she likes to jam with her sci-fi tripping band - The Manjunauts. Recently she has started Poetry Across Borders - a poetry reading circle that has an live online link with Melbourne and Berlin. Archana is a Fellow of the Art Think South Asia program. She was selected as one of nine people by the Goethe-Institut in collaboration with c/o Pop as a video art representative of the electronica music scene across South Asia in 2008. She was the recipient of the German Language Scholarship at Goethe-Institut/Max Mueller Bhavan - Bangalore in 2008, and knows a little of the language.